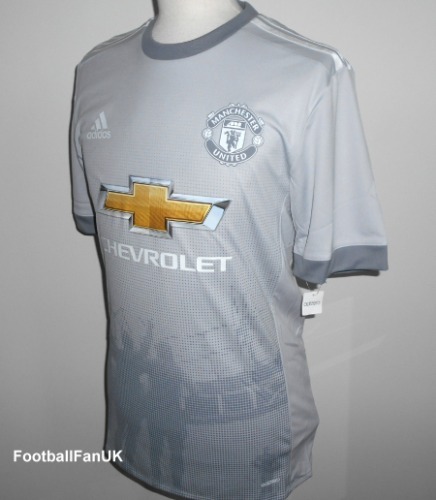 Man Utd 3rd shirt from the 2017/18 season, by Adidas. The shirt is an official Adidas shirt and is brand new with tags. This is the authentic commercial player issue version of the shirt, made with Adizero technology. It is designed to be very light, with transfer material club badge and Adidas logo, for zero distraction. There is an Adizero logo on the lower front and the shirt is a more styled and tighter fit. There is also a seperate 'Adizero' swing tag. Please note that all of our Adidas football shirts are official items, so you can purchase with confidence. - Features a lighweight transfer material club badge for zero distraction. - Transfer material Adidas logo for zero distraction. - Graphic on lower front of shirt. - Adidas Adizero technology and logo. - Adidas product code B30977. - Based on the actual shirts used by the players. - See our own photos of the actual item.